Please login to complete your purchase, benefit from our best deals, track your orders and much more. Don't have a Samsung Account? Create one now. Your account for everything Samsung. Please send me information and special offers on innovative Samsung products. Sorry, you can't be added to Samsungâ€™s Friends and Family Program as you're already a part of discount program. Be the first to 5G. * Get rewarded. * The Galaxy S10 5G - our first 5G-ready device - will be available for preorder nationally through 5/15/2019 (5G Ultra Wideband available only in parts of select cities). To learn more about which cities have 5G Ultra Wideband network, see a Verizon sales rep or go to vzw.com/5G. ** 18+ & 50 US/DC/PR/USVI only. Purchase by 5/15/2019 (“Purchase Period”) a Samsung Galaxy S10 5G, from a participating Verizon Wireless Authorized retailer, with device installment plan, 2-year contract plan, or outright purchase at full retail price (“Qualifying Purchase”), and receive a pair of Samsung Galaxy Buds, portable charger, and water bottle (est. value $225) (“Gift”). For residents of AK and HI only, the Gift will be awarded as a $225 Reward eCertificate. Gifts only available while supplies last. By 6/15/2019, using your Qualifying Purchase device, follow instructions on the Shop Samsung app (“App”) to submit required info. Gifts will be mailed apprx 6-8 weeks after verification of Qualifying. Only 19,000 Gifts available. If Gifts are unavailable for any reason, Samsung, in its sole discretion, may choose to issue a Reward eCertificate in the apprx value of the Gift as a substitute. 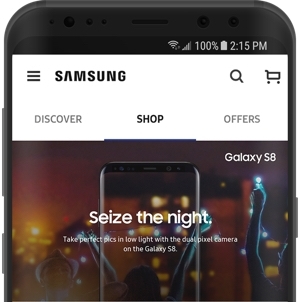 Reward eCertificates are valid only at www.Samsung.com or in the App for use towards an eligible purchase, and valid through 9/1/2019. Gifts subject to availability and are non-transferrable. Limit 1 Gift per Qualifying Purchase. Void where prohibited or restricted by law. Additional restrictions apply. Offer subject to additional terms here. Samsung reserves the right to modify or discontinue offer at any time by posting notice on the app or website. © 2019 Samsung Electronics America, Inc. Samsung, Galaxy S and Shop Samsung are all trademarks of Samsung Electronics Co., Ltd. All other brand, product, and service names and logos are marks of their respective owners. Screen images simulated. Appearance of products may vary.